A specimen found in Lincoln over a hundred years ago has recently been prepared and mounted for exhibition. It is now one of the most popular exhibits in the new Lincoln Museum. This is a rather personal account of a specimen with which I have a particularly close connection. It starts with a vague childhood memory of going to a museum Lincoln and looking down into case containing a plesiosaur. Many years later I was studying plesiosaurs in earnest and mentioned this to Mark Evans and Arthur Cruickshank. Neither had heard of such a specimen. So when I was in Lincoln on business I went to the library and asked if anyone knew about it. One of the older librarians remembered seeing it, and dug out an old museum guide which contained a reference to the plesiosaur. At that time the county museum was closed, and all the specimens archived while a new museum was being built. I arranged to have a look at the specimen in the stores, and went over there with Mark a couple of weeks later. 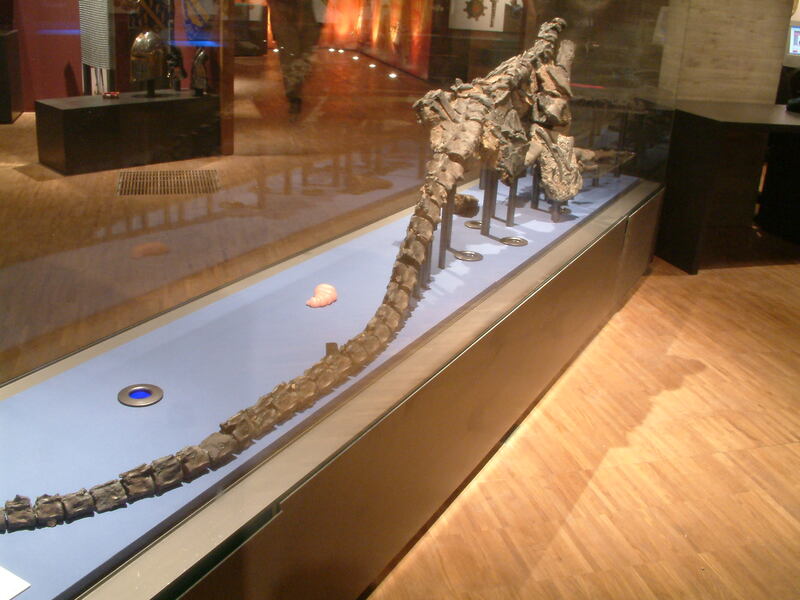 It turned out to be a substantially complete specimen lacking a skull, similar to a well-known genus called Microcleidus, of which there are specimens on display in York, Manchester and the Natural History Museum in London. These specimens come from the Alum Shales of the Yorkshire coast, and are Toarcian in age (see box on right). Around this time I had decided to undertake a PhD in plesiosaur palaeontology. I had already done some research into the vertebral column of plesiosaurs, and thought that this would make a good specimen on which to base a part of my thesis. 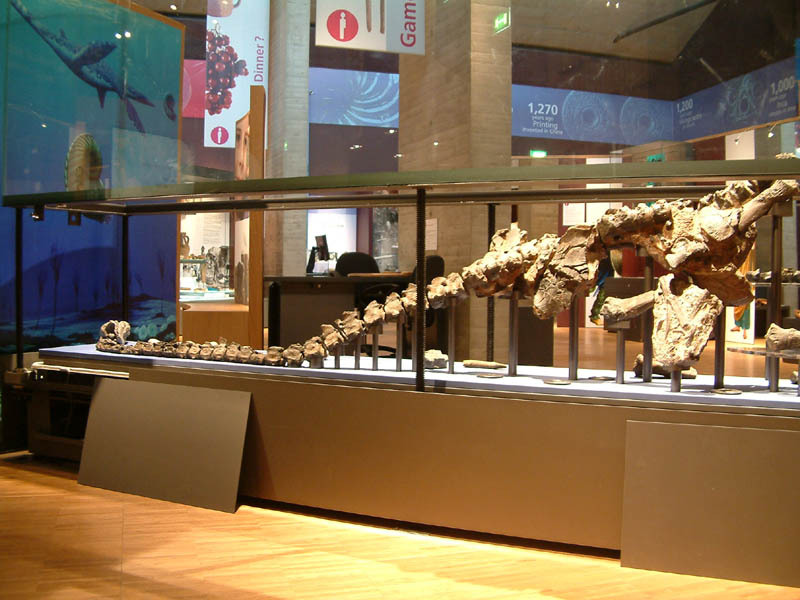 Much emphasis is given to the elements of the skulls of plesiosaurs in determining their evolutionary relationships. The preliminary findings of my research suggested the there is considerable value in studying other elements of their anatomy in understanding these relationships, and this seemed an ideal specimen on which to test my methods. When we rediscovered the specimen it was in a rather poor condition. Although some attempts had been made in the past to clean it up, mend broken elements, and restore missing elements, this had been done using inappropriate materials. I undertook the substantial task of cleaning and preparation as part of my PhD research. Working very closely with a specimen in this way forces you to look at every tiny detail, which adds greatly to an understanding of its anatomy. The preservation of the bones is extremely good, and now that they have been cleaned they show detail not recorded in other specimens. The vertebrae of the neck bear light ridges and areas of roughness which give an idea of how the muscles may have been attached and arranged. Shallow channels on the tail vertebrae mark the location of blood vessels, and in one case an area of damaged bone shows where infection occurred around one of these blood vessels. The process of fossilisation can be complex, and this specimen has unusual features showing that it went through a series of processes before it was fully fossilised. The body is in a series of nodules which preserve the vertebrae of the base of the neck and the back in articulation. At some stage during fossilisation the back has been broken, and the bones displaced by about 50cm so that two series of vertebrae lie alongside each other, and orientated in the same direction. In many specimens gut contents ferment, causing the body to expand and burst scattering bones over a wide area, but this process cannot displace articulated sections in this way. I found a clue to what had happened when I was preparing the specimen. Vertebrae are linked by interlocking bony projections above the body of the vertebra called zygapophyses. These help resist twisting of the spine. The vertebrae from the front part of the body and the base of the neck have been twisted, and a series of zygapophyses are progressively twisted away from contact with the preceding vertebrae until they are completely separated. Beyond this point the spine is broken. This shows that the spine was twisted violently enough to sever it completely. Further preparation of the spine showed marks which look like those of the teeth of a large predator where the spine had been twisted. An interpretation of these clues is that the plesiosaur was attacked by a large predator, probably another plesiosaur of a family we call Rhomaleosaurs. The attacker grabbed its prey at the base of the neck, and twisted violently enough to completely sever the spine. This is called 'torsion feeding'. Modern crocodiles use this same strategy when attacking larger animals. For some reason the attacker didn't carry on to eat its prey, so the carcase sank to the bottom of the sea, with skin and muscle holding the two halves loosely together. It is possible to reconstruct the way the carcase was lying in the sediment of the sea floor by matching broken bones, and this shows that some parts were still attached to the front half, others to the back half. An enjoyable twist to the story of this plesiosaur is that there is now a primary school on the site on which it was found. The children of the school are very proud of their plesiosaur, which is incorporated into their school badge. I don't know of any other school in the world which uses a plesiosaur in this way. There is still a fair amount of work to be done before this specimen can be published. When it does, it will form a major part of my PhD thesis. In the meantime, it is on public display in the splendid new museum in Lincoln, and well worth a visit.